40 Years of Global Earthquakes by Region. | Chaos Sweeps Away the World We Know! The Disaster, current events & Catastrophe Blog. Forecasts for 2014 to 2022. Read tomorrows news today! Plus current economic, commodities, stock indices and financial news. ← Ten Earthquake in Six Days, Five in February. 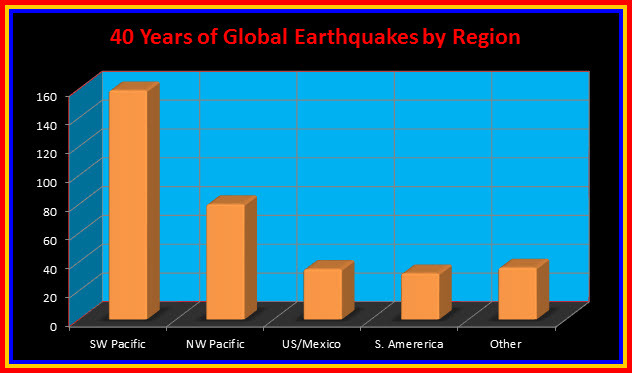 February 3, 2013 – 40 Years of Global Earthquakes by Region: The chart above reflects global earthquakes, greater than or equal to 7.0 magnitude, by five regions of the world over the last 40 years. The SW (south-west) Pacific was the “winner” by far. This region included all of the SW Pacific below 30 degrees North Latitude. The countries, in this region and the number of quakes are Indonesia (36), the Solomon Islands (19), Papua New Guinea (16), the Philippines (14), New Zealand (14), Vanuatu (12), and others. This area saw the December 26, 2004 Sumatra mega-quake; that killed over 200,000 people, primarily from the subsequent tsunami. Next in line was the NW (north-west) Pacific (above 30 degrees North Latitude). Prominent here are Japan (37) and Russia (24). This region witnessed the recent Japanese earthquake and tsunami of March 11, 2011. Again, most of the damage and deaths were due to the tsunami. The United States and Mexico were a surprising third (I was expecting the west coast of South America). South America was fourth, with Chile experiencing over half of the major tremors in this location. The largest earthquake in the last 100 years occurred near Santiago, Chile in 1960. The other groups includes seven regions such as Antarctica, Africa, the Caribbean, Latin America, Europe, the Middle East and others. This entry was posted in Africa, Alaska Earthquakes, Aleutian Islands Earthquakes, American Samoa, Argentina, Australia, Bolivia, California, Chile, Chile-Bolvia, China, Death, Disasters, Earthquake, Ecuador, Egypt, European Union, Events, Fiji, Greece, India, Indonesia, Iran, Iraq, Japan, Kamchatka Peninsula, Mexico, Misc, Miscellaneous, Nature, New Caledonia, New Zealand, News, North-East Pacific, Pacific Ocean, Pakistan, Papua New Guinea, Papua New Guinea, Peru, Peru-Bolvia, Philippines, Ring of Fire, Russia, Samoa, South Pacific Ocean, The Kingdom of Tonga, The Ring of Fire, The Sandwich Islands, The Solomom Islands, United States, Vanuatu, Venezuela and tagged Afganistan, alaska, algeria, american samoa, antaractia, antigua, argentina, Australia, barbuda, bolivia, california earthquakes, callifornia, chile venezuala, China, cile, columbia, congo, Costa Rica, Cuba, diego garcia, earthquakes, ecuador, Egypt, el salvador, fiji, finalnd, Georgia, Greece, guam, guatemala, haiti, hawaii, honduras, idaho, india, indonesia, iran, irul islands, Japan, kamchatka penensula, kazakstan, loryansky, maderia islands, martinique, mexico, monzambique, new caledonia, new zealand, nicaragua, north-west pacific, pakastan, Papua New Guinea, Peru, philippines, Quakes, romania, russia, samoa, south american, south-west pacific, st. kitt, sundan, taiwan, the kingtom of tonga, The Master of Disaster, The Ring of Fire, the solomon islands, tonga, tremors, turkey, United States, US, us earthquakes, USA, uzbekistan, vanuatu, wordlwide earthquakes, world earthquakes. Bookmark the permalink. 2 Responses to 40 Years of Global Earthquakes by Region. Thank you for your very informative blog, Master. Curious to see where this is all leading to. As Jacquelyn says, keep up the great work!